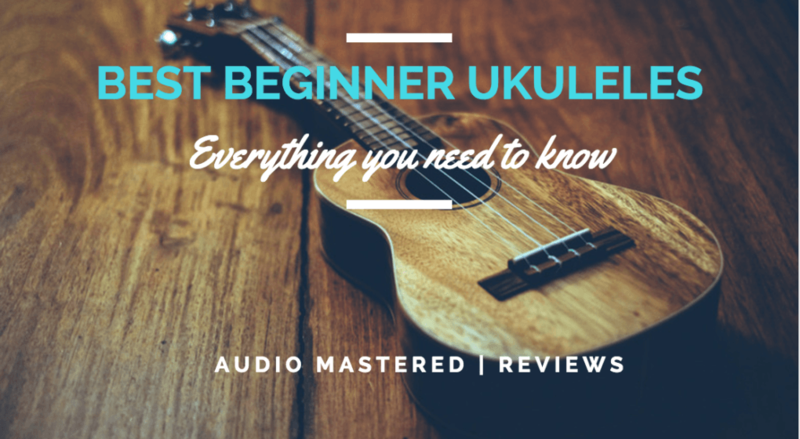 So you’re looking to learn the ukulele? Well, look no further. We’ve compiled a list of the best ukuleles for beginners so you don’t have to spend hours researching online. Once you’ve finished this article, you’ll have all the information you need to select the ukulele that best suits your needs. Due to their small size, soft strings and unique sound, ukuleles are often the ideal instrument to learn on. The best part is, you can buy a good quality ukulele within the $50-$100 dollar range. We’ll briefly cover the ukulele basics and touch on a few considerations to keep in mind when selecting your ukulele. We will then suggest our top picks for the best ukulele for beginners. Note: For you first ukulele, it’s best to pick up a concert size ukulele. 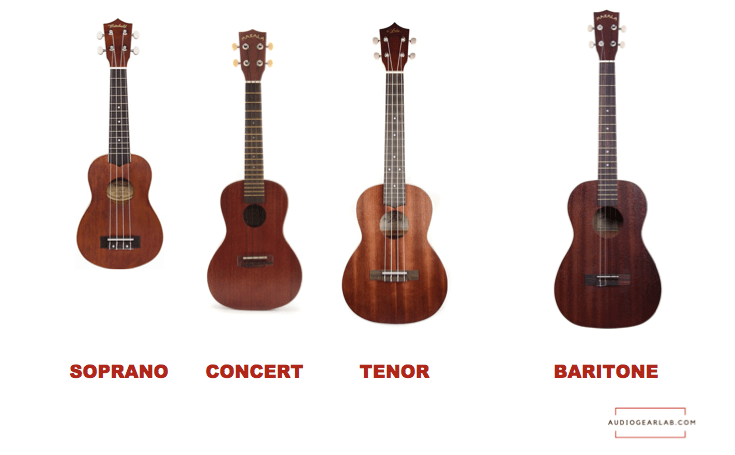 If you are set on picking up a soprano ukulele, you can check our favorites. Ukuleles originated in 19th century Hawaii and have since spread internationally. The ukulele typically uses four nylon strings with a guitar style body. The tone and volume of the instrument will vary with size and construction. Ukuleles commonly come in four sizes: soprano, concert, tenor, and baritone. Each type will have a unique tone and range. The smaller the ukulele, the higher the tone. The ukulele you select will depends on the tone you want. Keep in mind that the soprano fretboard is much smaller and will be harder to learn on for beginners. We recommend learning on a concert size uke. The concert size will be large enough for your fingers and still give you the classic ukulele sound you are looking for. 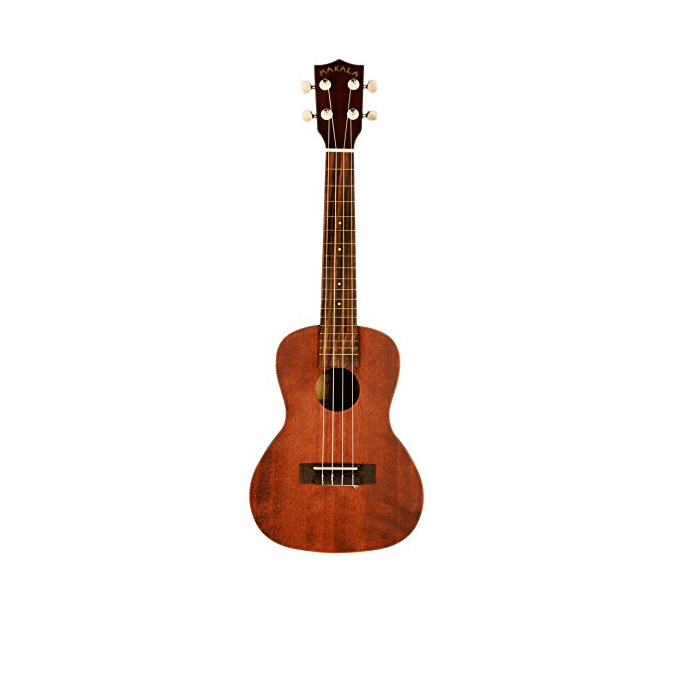 If you are buying for a child, the soprano ukuleles will be a perfect size. You can find my picks for the best soprano ukuleles under $100 here. Ukuleles typically come in three different shapes: guitar, pineapple, and boat paddle. The guitar shape, as seen above, is by far the most common. The pineapple body shape typically has a rounded back. It was first introduced by the Kamaka Ukulele Company. We recommend sticking with the common guitar style ukulele for your first uke. If you are interested in the major players in the ukulele scene you can check out the top ukulele brands here. If you are just starting out, buy a concert ukulele. Plain and simple. Your fingers will fit better and you will recognize the classic uke sound. The sound will be louder with deeper mid-range tones compared to a soprano. If you have very small fingers, or you are buying for a small child, then you will be able to get away with a soprano. Take note that the tuning for a baritone will be different, which means you will not be able to play the typical tabs found for ukuleles on the internet without additional searching. The volume of the ukulele will depend on the size of the ukulele. As you progress through your learning experience, you can buy different sizes that will allow you to play in different tone ranges with different qualities. Although you can find ukuleles made of synthetic materials, most ukuleles are made of either solid wood or laminated woods. The type of material used during construction will have a factor on the final selling price. Generally speaking, higher quality ukulele bodies are made with solid woods. Laminated woods typically are stronger, less prone to cracking, and maintain their tone over their lifetimes. Solid woods will have a rich tone that settles over its lifetime. We recommend selecting a solid body ukulele as you will appreciate the tone difference as your ears and skills develop. Thankfully, nowadays it’s possible to get a solid wood body for a reasonable price. The sound of a ukulele will be determined by the size, shape, material, sound hole, strings, and construction quality. For beginners, we recommend selecting a ukulele within the $50-$100 range. This will ensure the construction of the ukulele will last and will carry a good tone quality. Nothing is more frustrating than having to tune your uke every 15 minutes due to poor quality. As you develop as a player, you will begin to appreciate a higher tone quality and can justify spending a little more on your uke. The Kala MK-C Makala concert ukulele is a perfect beginner uke. The bundle will provide you with everything you need to get playing right out of the box. This uke will be perfect for a progression from beginner to intermediate, saving you from having to upgrade right away. The Agathis body will give you a rich tone and the rosewood fingerboard will prevent any fret wear. We like the geared tuners, as this will ensure the tuning will stay consistent as long as possible. Warm and prominent midrange with balanced highs and lows. Not for bass heads. 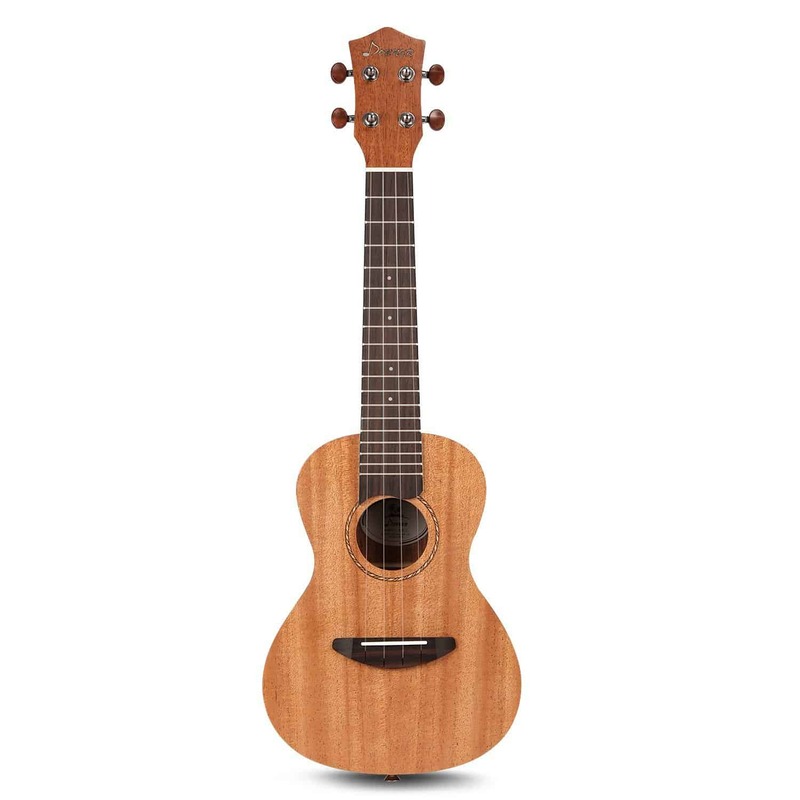 Bottom Line: Overall, a great beginner ukulele. Perfect for anyone looking for the complete package. You may want to purchase additional felt picks. The Donner DUC-1 has similar features as the Kala MK-C with a solid wood body and hardwood neck. The bundle option will give you all the accessories you need to start playing. We personally love the tone of mahogany body ukuleles. Mahogany generally imparts a darker, warmer tonality. As you begin to develop your ukulele skills you will notice the difference quality strings makes on the sound of your uke. The included carbon strings will save you an additional purchase down the road and give you a great sounding uke right off the bat. Bottom Line: Another fantastic option. If you are looking for a warm, rich tone, this ukulele would be a good choice. 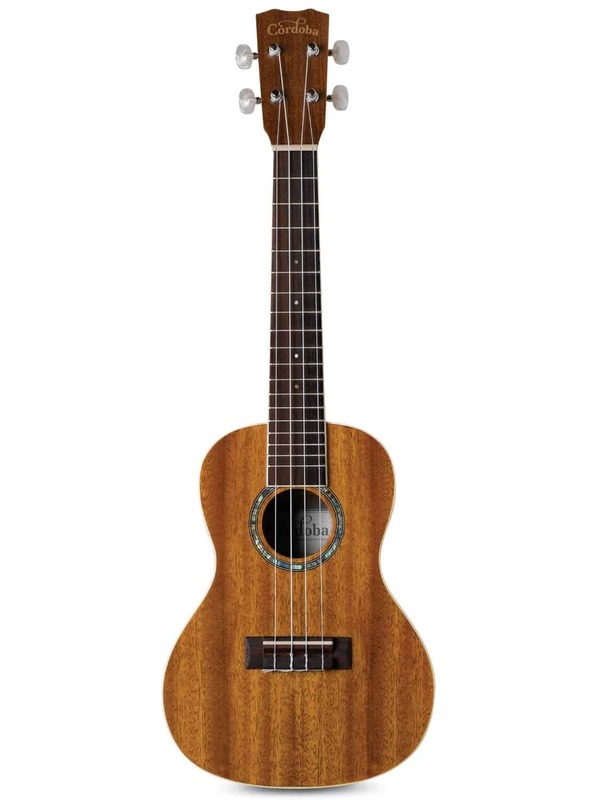 The most expensive of the three, the 15CM is Cordoba’s best selling ukulele. If you appreciate the small details and want an entry level ukulele that looks as good as it sounds then this is the ukulele for you. We love the visual features of the satin finish, silver tuners, and pearl buttons. We think Minyan Zhu sums it up nicely when he says. “I was expecting something decent looking and sounding when I ordered this product. Great aesthetic appeal with a good sound quality to back it up. ​You will be sounding amazing with the premium Aquila strings and full mahogany body. Aquila strings are known to provide exquisite tone and lasting durability. We love this beautiful option for a beginner who appreciates the visual details. Bottom Line: Something for those who want the aesthetic appeal along with the rich, warm Mahogany tone.